St. Bernadette Catholic School hosts another successful lemonade stand in support of Jack’s mission. A special thank you to Emily for her efforts in organizing this!! Set to hold 2nd school lemonade stand in support of Jack's Lemonade! 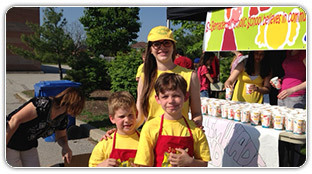 The 4th Jack's Lemonade Stand for SickKids took place on May 29th at Pine Glen Park and was an incredible success! More than 2,500 cups of lemonade were poured and now more than $200,000 has raised! JACK HAS MOVED BACK HOME from Bloorview Kid's Rehab Hospital. Students support Jack's Lemonade at the 2nd annual Cowboys & Cowboys social. Two inspiring children, Evan & Martina, supported Jack's efforts at their birthday party and generously asked for a donation to Jack's Lemonade in lieu of gifts. Jack is medically stable and has been transferred from SickKids to Bloorview Kid's Rehab Hospital to begin rehabilitation. Isabella rallied her classmates at St. Mildred's and held a Valentine's Day fundraiser in support of Jack's Lemonade. What makes Isabella particularly inspiring is that she too, like Jack, has epilepsy. Jack has been admitted to SickKids to undergo several brain surgeries. Lululemon Oakville supports Jack’s Lemonade as a community charity - Thank you LEMONS! Riley shaved his head to raise funds for Jack's Lemonade! More than $800 was raised! With over 50 members and Jack’s Grandma as the team captain, the Jack’s Lemonade “Pucker Up” Team creates a splash at the Scotia Waterfront Marathon! Jack and helpers serve up 700 glasses of lemonade at his school BBQ. Thank you for the support! 7-yr.-old Luke Ivan and friends host “Luke’s Friendship Center” in support of Jack’s Lemonade. 1st annual SickKids Epilepsy Family Education Day happens because of Jack’s Lemonade! Thank you for holding a 2nd annual car wash in support of Jack’s Lemonade raising $2,000! 3rd Jack’s Lemonade Stand for SickKids! Thank you! Whole Foods Market supports Jack’s Lemonade Stand through the “One Dime at a Time” program, which encourages shoppers to return their bags, while raising money for a great cause! In lieu of birthday presents, 6-yr-old Sophie-Marie very generously requested donations in support of Jack's Lemonade! thank you for the "Sunshine Poster" made for Jack, which was designed by all the students. 6-yr-old Luke Ivan rallied his entire hockey team to hold a hockey goal-scoring challenge in support of Jack’s Lemonade! Holds a Western-themed Pub Event, including a mechanical bull, in support of Jack’s Lemonade Stand! Donates more than $15,000 to Jack’s Lemonade mission at their annual Christmas Party! Thank you for believing in SickKids! Jack's Lemonade was the beverage on tap raising $520. Thanks fo baby Jack for inspiring his parents to support Jack's Lemonade in lieu of wedding favours. Build-A-Bear Workshop presents Jack with "2008 Huggable Hero Award"
Luke Ivan forms "Glenfield Rd Crew" and hold Luke's Apple Juice Stand in support of Jack's Lemonade. hosts Jack's Lemonade Stand at their annual BBQ. presents Jack with a "Making a Difference Award" at their Calgary gala hosted by Ben Affleck. 2nd Annual Jack's Lemonade Stand host more than 1,000 thirsty guests, raising over $45,000! Cosmetic Department held a teddy bear auction in support of Jack's Lemonade Stand and raised $1,600. hosts a car wash in support of Jack's Lemonade Stand and raises $2,100. while the youngest Longo family members impressed Jack with their pouring efficiency, the choir touched shoppers with their special performance of "Make Lemonade" personalized for Jack. the rainy weather couldn't dampen the generour spirit of shoppers - $2,200 was raised. holds a bake sale in support of Jack's Lemonade, raising almost $300. Thanks to all the amazing students who helped and to teach nadia McDonald for sharing Jack's story and mission with the students. presents Jack with the "Spirit Award" at the Kids Believe in SickKids Giving Gala.